Mas-issneun. 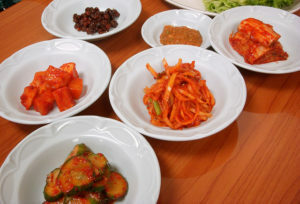 S. Korea is world famous for its delicious traditional fermented foods! One of them is kimchi, which is almost as popular as Japanese sushi across America, Europe, Asia, and many other parts of the world. But there also many other delectable fermented dishes S. Korea has to offer your taste buds and health, like cheonggukjang (chongkukjang) and doenjang. Here are a few great selections you can try! The rocky oceans and harsh, tall mountains that seemingly imprisoned the Korean peninsula also cultivated an exotic culture unique to other Asian cultures because it wasn’t influenced as much by neighboring countries and was allowed to thrive independently. These isolated conditions and sometimes harsh climates brought about the creation of S. Korea’s unique fermented foods because these wise, ancient people learned to preserve food in abundance for when times become rough. Cheonggukjang is one such fermented creation. It’s a scrumptious, crimson-colored dish made by boiling soybeans and fermenting them for up to three days. First you wash the soybeans and boil them in a pot until they turn red. Strain the soybeans and keep them in a place 20 degrees above room temperature with some rice straws. After fermenting for a couple of days, you can crush the soybeans into a paste or leave some unground. You can add chili powder and other seasonings to the soybean paste. You can use cheonggukjang in a stew of diced tofu, minced garlic, anchovies, ground pork, onion, and other yummy ingredients! paste at your local Asian supermarket and simply add it to your dinner stew. 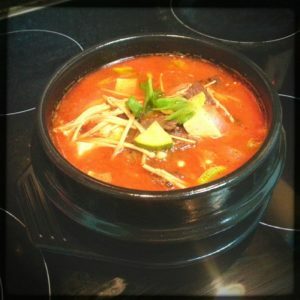 Cheonggukjang is not only delicious, but holistically healthy too! Scientists found it has anti-viral properties and can relieve allergies. (See references) Its probiotic content also aids digestion and cures many ailments. Photo by Debbie Tingzon. Rights Reserved. Doenjang is fermented soy, just like cheonggukjang, but is fermented far more extensively. Soybeans are soaked for 6 to 12 hours, then are boiled in water with salt until the soybeans turn red. The soybeans are strained then completely pulverized via mortar. You then compress the pulverized soybeans into a ball or cube and dry it for 7 to 14 days until it’s firm. Then you wrap it with rice straw to start the fermentation process for a few months, after which you wash the outside of the now fermented soy compression and sundry it. The sundried compression is aged with charcoal and chillies, then mashed into a paste, which is doenjang! You can dress your salad with doenjang or even use it as a kind of salsa for chip-dipping! But the best way to get the most of its exotic, scrumptious flavor is to use it in soup or mix it with garlic and sesame oil and place it on rice wrapped with vegetables. Get a taste of S. Korea and try these traditional fermented dishes today! You’ll be experiencing new exotic flavors, broadening your culinary options, and healing your body too! 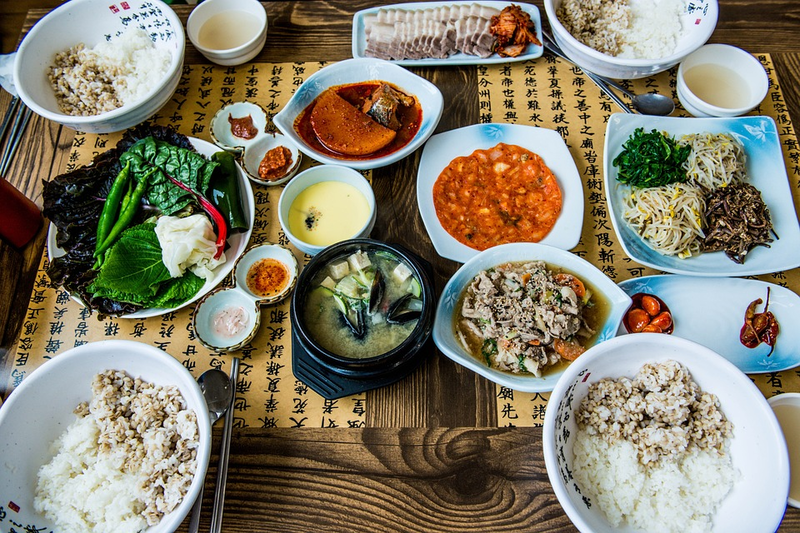 Come visit S. Korea for some authentic dishes, or shop at your local Asian supermarket to buy doenjang, cheonggukjang, and a wealth of other Korean delicacies! I discovered your website by chance I will just say awesome!